Many tourists and expats want to know a bit more in detail what the cost of living in Cape Town South Africa entails, you will find here my price comparison for popular items you will shop for. In my Comparison of the Living Expenses you will find prices of groceries, household items and petrol in South Africa compared to the equivalent price in the USA, England and Germany. 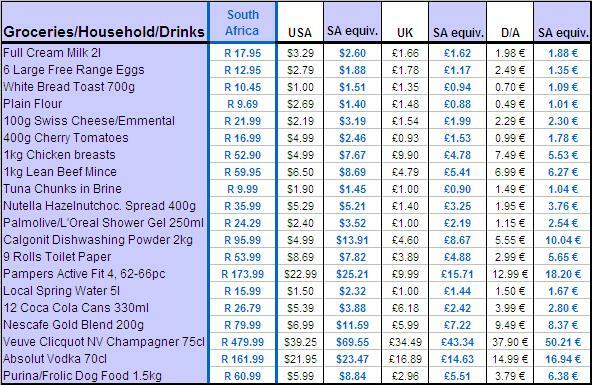 For this Cape Town cost of living survey I not only researched current prices in the Mother City but also researched the corresponding prices for these common items in the shops and supermarkets overseas. Here in my listing of groceries and other popular supermarket products I give you the price of the products in Rand first and then the researched price of the items if you shop for them in the USA, UK or Germany. Next to the price you pay in your home country in US-Dollar, Pound Sterling or Euro you will find the blue price for the product, which I bought in South Africa, in your home currency for better comparison. You will have noticed that some of the products are sold in different sizes or content in the various countries, but I have tried to compare these items with average prices and calculated the equivalent price for a standard size. The second chart compares the petrol or gas price and the diesel prices from Cape Town South Africa to the average price you pay currently in the USA, UK or Germany. How did I get these prices? Well, the prices from the USA, UK and Europe were found through enquiries with family and friends and the online shopping sites of the big supermarket chains. I hope you find my South Africa Cost of Living Information useful when planning your living expenses for your next trip to Cape Town or when planning to move to South Africa and you need to make a thorough cost of living calculation for your relocation salary. If you want to research for other items, use my more comprehensive listing of food items and their prices in South Africa and use a currency converter which you will find on that page too. Are you interested to get regular updates and insider info on living in Cape Town? Then make sure you subscribe to the free ExpatCapeTown Newsletter here.